« What the Heck is a Spring Chicken Anyway? I always think of preserved lemons as a North African ingredient, lending an exotic, mysterious flavor to Moroccan and Tunisian cuisines, among others. But recipes for “pickled lemon” can be found in several 18th and 19th Century American and British cookbooks and I was surprised to find them in a spring rabbit recipe in Patricia Wells’s classic At Home in Provence. I’ve also seen mention of a Cambodian chicken soup made with whole preserved lemons that sounds very intriguing. Nowadays, of course, we can get lemons whenever we want, albeit shipped halfway around the world. In the past, once the season was gone, the only way to capture some of that sunny taste was to preserve them in salt and sometimes other spices. The salt intensifies their citrus flavor and mitigates much of the bitterness found in the pith of the fruit. Both the pulp and the rind are used in cooking. The best part is, preserved lemons are stunningly easy to make. All you need are good lemons, salt, a jar, and some time. I really should have made my batch in winter when the citrus groves nearest me (Florida and California) are producing fruit at the peak of ripeness, but I guess late is better than not at all. Since the peel is going to be eaten, it is important to choose officially certified organic lemons or confirm with the farmer that they have not been sprayed with pesticides. It is also important that they be unwaxed. Any kind of coarse salt will do. I was given a bag of the famous French Sel Gris de Guérande as a gift. This large-grained, gray salt has been collected from salt marshes in northeastern France since the 9th Century. I’ve had some really good Moroccan food in Paris, so using French salt for this project seemed just the thing. This recipe is a bit like that old magic trick where you soak an egg in vinegar and then are able to squeeze it through the opening of a bottle that looks far to small for the purpose. I was very skeptical about fitting 4 lemons into a quart sized canning jar, but it works. In fact, depending upon the size of your lemons, you might cram 5 in there. Just be sure to start with the cut side facing down into the jar so the juice goes inside as you are squeezing them into place. These will be ready to use in about a month. I’ll report back then on the chicken tagine with preserved lemons and green olives I’m planning. Scrub 4 (5 if they’re really small) of the lemons under running water with a stiff brush. Dry them well. Use a serrated knife to partially quarter the newly washed lemons. Start cutting at the top but do not cut all the way through, stop about ½ inch from the base. Pull the 4 pieces apart slightly, being careful to keep them connected at the base. Sprinkle salt all over the insides of the quartered lemons and then push the pieces together to keep the salt from falling out. Put the salted lemons in a large bowl and gently toss them with the remaining salt. Push each lemon into your sterilized jar, cut side facing into the jar. 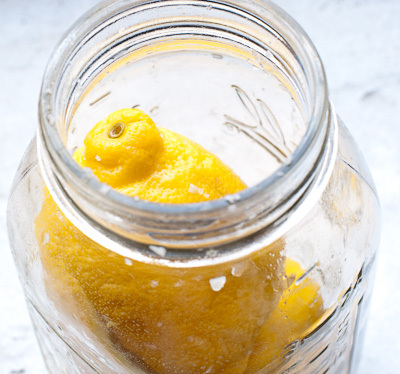 It may seem like they won’t fit but if you squeeze and push gently, giving the jar a quarter turn each time, eventually the lemons will compress and squeeze into the jar. Some of the juice will come out in the process, but that’s fine. 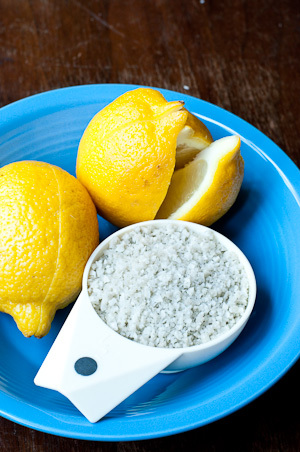 After each lemon goes into the jar, sprinkle in some of the salt left in the tossing bowl. Before pushing the last lemon into the jar you may need to squash the others down a bit with a wooden spoon to make more room. Sprinkle the last of the salt on top. Juice the remaining lemons until you have enough juice to completely cover the lemons in your jar, leaving about ½ inch of head space at the top. Close the jar tightly and allow the lemons to ripen at room temperature for 30 days. Turn the jar upside down every other day to help distribute the salt and juice. After 30 days the lemons are ready for use. For long term storage, cover with olive oil and store in the refrigerator for up to 1 year. Hi, for the leomon to be ready in just 4 weeks, i just boiled them for 3 minutes, then put them in jar , add salt and should be ready .